Appetizer. Furikake Kettle Corn. But no movie. Feast. Beer Can Chicken with century egg and fresh radish. No ID required. 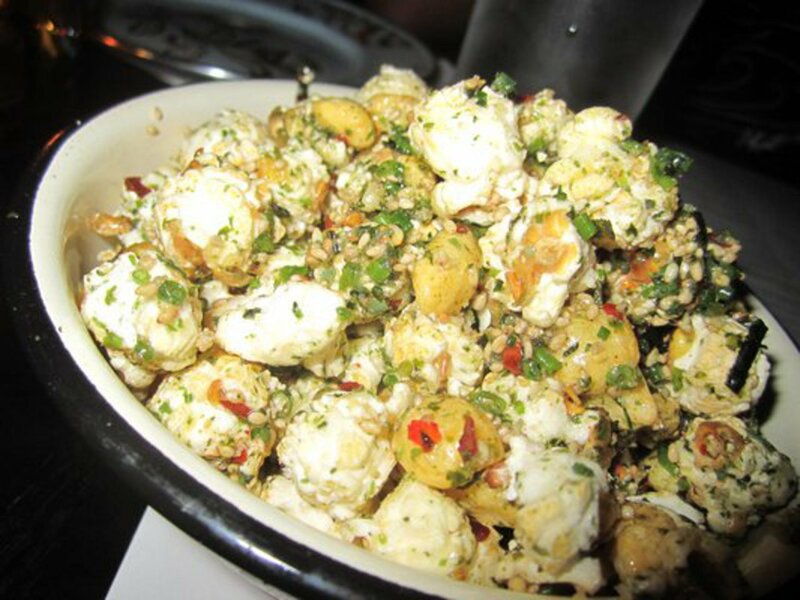 Furikake Kettle Corn. To the very core, it was furikake infused popcorn with a slightly sweet hint. Usually, furikake, a Japanese spice mix that consists of seaweed, sesame seeds, bonito flakes, salt, and sometimes dried fish, is used on plain, steamed white rice in order to infuse flavor, and make things interesting. It’s basically a spice mix; its constituents are no more complicated than creating a curry powder from individual ingredients. Kettle corn differs in two ways; the method of preparation, and the subsequent flavoring that goes with it. Kettle corn, like its name, is traditionally made in a…surprise…cast iron kettle. The corn is flavored with a light coating of sugar n’ salt which caramelizes and forms a thin, sticky transparent layer of sticky sugar, which I presume grabs on to salt molecules, giving rise to a dual flavor profile. Cast-iron is traditionally used because it evenly distributes heat across the cooking surface. When the radiation from the heating element (the stove or fire) is retained and distributed evenly the resulting “cooking/popping” turns out to be consistent. The same principle applies when searing steaks in a pan. When cooking, we want even heat distribution, as when we order a medium-rare steak, we want all parts of the steak to be medium-rare, not a couple of corners. We don’t want steak “two-ways”…we want it one way, one form of done-ness. Even heat distribution relies upon the method of cooking, the quality of your cookware, as well as the thickness and shape of the particular food that you are cooking. A diced onion cooks differently from a sliced onion, for example. The former faster than the latter. The best kettle corn, in this case, would be made with an even heat distribution and plenty of stirring, in order to avoid burned or unpopped kernels. Speaking of unpopped kernels, the science of popping corn is somewhat analogous to the operation of a bomb. (Yeah we know you’re interested, you mischievious rascal). The two main parts of corn that we focus on when talking about popcorn consists of the hard shell (pericarp) and the soft innards (endosperm). The pericarp, which is higher in celluose, a plant fiber, presents itself as a hard, seemingly inedible shell, but, due to its increased amount of fiber, is an excellent conductor of heat. 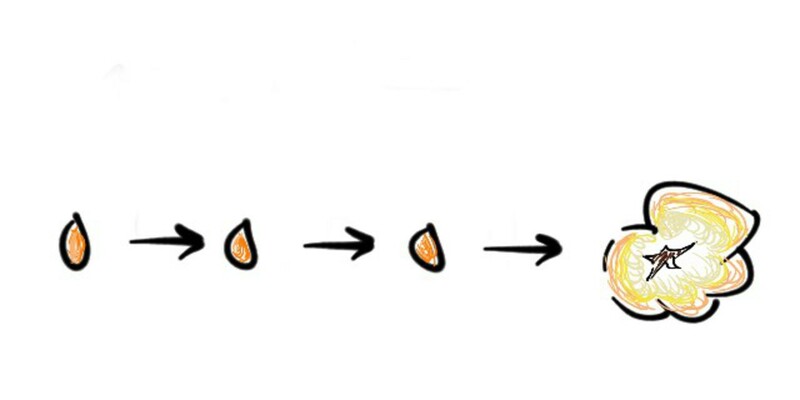 Thus, when we transfer the heat from the stove to the cast iron and eventually to the pericarp, the heat is further transferred to the internal endosperm. 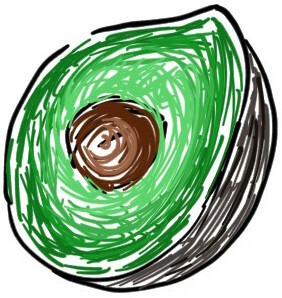 Given time, steam pressure would build up inside from the moisture content of the endosperm…and pop. Nuclear zombie apocaplypse. The steam softens the endosperm and eventually needs to find the path of least resistance in order to relieve the pressure, which breaks open the hull. The sudden drop in pressure from the breaking of the hull causes the steam to expand (remember pressure is inversely proportional to volume), which causes the endosperm to take on the shape of what we know as…popcorn. Subsequent flavorings such as salt, sugar, pepper, butter, paprika, seaweed, etc, eventually coat the exterior, and create what we know as popped corn. The process in a microwavable bag is no different. Microwaves are designed to vibrate water molecules (essentially adding kinetic energy), which in turn would eventually convert water to steam. The eventual process is the same, except for the gross bagged part. Stick with fresh. I wish the Big Bang was as easy as this. The main course: Beer can chicken and Century egg. Beer can chicken can be a literal or figurative explanation, as it can be cooked in a beer can itself, with brewed beer at the bottom (which I suspect was the case here). Vaporization of the beer occurs during the cooking process, perfuming the beloved chicken in beer-infused vapors. Spices and herbs were most likely added. Another gaseous flavoring method, probably in addition to stuffing the chicken with goodies. Ordinarily though, I suspect the chicken to simply be speared upright. Since we were on the topic of even heat distribution, beer can chicken is essentially made by a slow, indirect heat transfer, yielding crispy skin and a moist, tender to the bone interior. Indirect grilling is basically slow cooking in a manner that isn’t subject to direct heat, but rather to indirect (put off to the side) heat. In a sense, it’s basically cooked low n’ slow, where the ambient temperature around the chicken is uniform. This method of cooking allows the entire chicken to come to an even temperature, all at the same time. The resulting meat from low n’ slow roasting is succulent and juicy as moisture loss is minimal compared to high-heat searing. When proteins are heated, they not only shrink, but denature; this causes the water within the protein matrix to be squeezed out. The higher the heat, the faster the moisture is squeezed out. This is the reason why lean meats, such as chicken breast, London broil, or rabbit, become supremely dry if simply cooked at high-temperatures. Two ways to avoid dry, unappetizing meat is to slow-roast it, so the loss of moisture is minimal, or…ditch the lean cuts and go with fattier cuts of meat, such as bone-in chicken thighs, and rib-eye steaks. Or, stick with lean meats and have a side of a stick of butter. Fattier types of cuts, even subjected to higher temperatures, would retain their moisture due to the bone being present, as well as intramuscular fat. Bone and fat both heat much more slowly than protein itself, therefore providing not only flavor and moisture, but a “heat sink,” preventing the quick overheating and drying out of protein matrices. Uniform, slow heating also causes the meat’s own enzymes to kick-in and do some self-tenderizing (isn’t it nice that everything’s built in?). 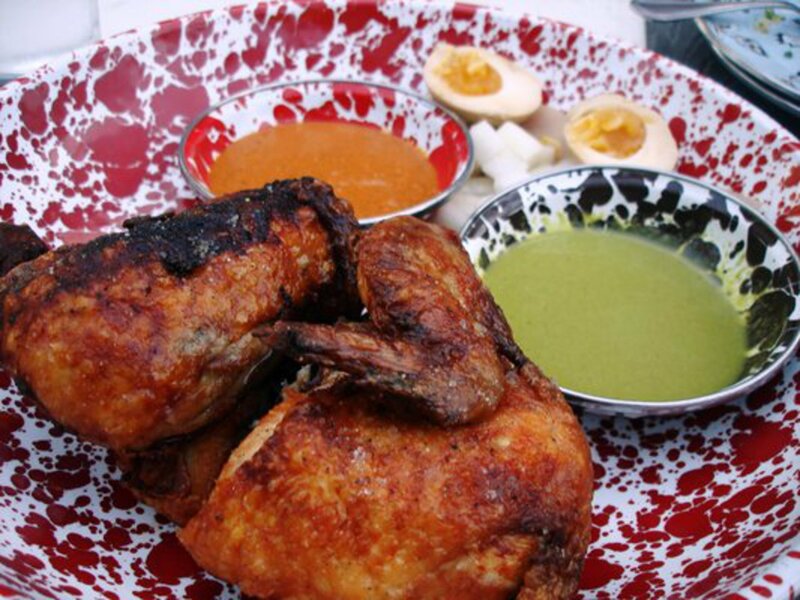 Crispy skin is achieved through dry roasting as the moisture on the outer layer of the chicken evaporates. I didn't get carded for this. My chicken had crispy skin, albeit the browning was a bit overdone, and the leaner parts of the bird were a tad-bit dry. My estimation was that the bird could have used 5-10 minutes less roasting for perfection. The skin wouldn’t have been as charred, and perhaps a bit of the moisture would have stayed. Although, when it comes to chicken, better safe than sorry. You can’t order chicken medium-rare. And you shouldn’t. The second aspect of the main dish, the century egg, struck me as an oddity, as I wasn’t sure if the chef was making a half-reference to the Chinese preparation of the thousand year egg (Was it prepared in one-tenth the time?). The thousand year egg, a Chinese delicacy, is most commonly prepared using preservation methods such as salting or alkinalizing substances (base). Thousand year eggs are prepared by using alkalinizing substances, such as lye, sodium carbonate, or lime. Salt is also used. Immersion of the egg in the alkalinizing substance increases the egg’s pH to as high as 12 (the higher the pH, the more basic the environment), which not only disrupts protein structure, but confers highly negative charges as the lack of protons (remember acidic environments contain many H+ ions…chemistry 101), keeps ions unprotonated. The salt in the solution would eventually mediate these negative charges, to the point of creating a soft gel. The resultant color change and smell are from the reactions of ferrous sulfide, which produce ammonia and sulfur, contributing to not only the ghastly look of the thousand year egg, but the rather distinct smell. If you got lost during that paragraph, just try the eggs when you see em’. They’re good. The Century egg at A-frame was hardly ghastly, as I assumed that it was just a shorter version of the thousand year-egg. No, they didn’t give us a tenth of an egg. The treatment of the egg though, resembled a salted egg, perhaps in a solution that contained hoisin, soy sauce, or molasses…any dark-brown type of coloring. I’d guess Asian, and go with soy sauce.